Luc Novovitch remembers being taken by surprise when he learned that a new, 148-mile natural gas pipeline was coming to the Texas county where he had served on the Commissioner’s Court, whether locals wanted it or not. Brewster County is a rural west Texas county, the population hovering around 9,000, that is popular among tourists for its scenic views and relative short drive to the Big Bend National Park. The desolate region had no massive natural gas pipelines until last year, when Energy Transfer Partners began constructing the Trans-Pecos Pipeline. As locals learned in 2015, swaths of land in Brewster County fall in the path of the Trans-Pecos Pipeline project. The pipeline, according to operator Energy Transfer Partners, is expected to deliver 1.4 billion cubic feet of natural gas per day to Mexico. Originating in Texas’ northern Pecos County, the pipeline makes its way through Central West Texas before finally terminating at the United States-Mexico border. 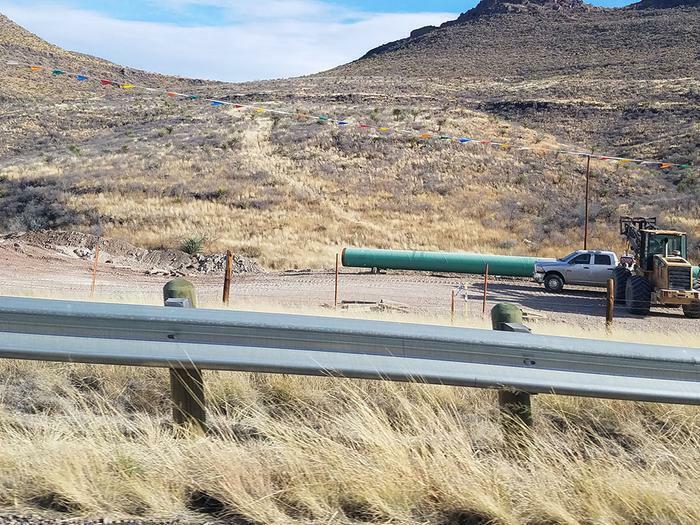 "The Trans-Pecos pipeline will provide new market outlets for domestically produced clean-burning natural gas, thereby encouraging continued production in the U.S. energy sector," Energy Transfer Partners says on their promotional website. By the time Energy Transfer Partners executive Rick Smith made a presentation to the Brewster County Commissioner’s Court about the project in April 2015, Novovitch remembers it was all but a done deal. “I tried to bring the attention of the feds about what was going on, and it didn't really help,” Novovitch, who is no longer on the Brewster County Commissioners Court, now tells ConsumerAffairs. With incoming President-elect Donald Trump expected to dismantle whatever environmental protections he can come January 20, environmentalists are concerned about what health and ecological dangers the new administration may bring. But if Donald Trump’s agenda includes fast-tracking as many oil and gas pipelines as possible, he can thank the Obama administration. Regulations that President Barack Obama used his executive authority to enact in 2012 have allowed for expedited reviews of oil and gas pipeline projects, setting what environmentalists warn is a dangerous precedent. In March 2012, as Republicans accused Obama of dragging his feet on approval of the Keystone XL Pipeline amid objections from environmentalists, the president took a trip to Cushing, Oklahoma. It was there, in the heart of oil country, that companies like Keystone XL’s Transcanada aimed to build more pipelines to transport all of the oil and gas produced by the domestic fracking boom. “We are drilling all over the place. Right now that's not the challenge. That's not the problem. The problem in a place like Cushing is that we’re actually producing so much oil and gas, in places like North Dakota and Colorado, that we don’t have enough pipeline capacity to transport all of it where it needed to go," Obama told the crowd. At that time, Obama issued a Presidential Memorandum, calling for, as his memo described it, “Expedited Review of Pipeline Projects from Cushing to Port Arthur and Other Domestic Pipeline Infrastructure Projects.” The executive order sounds innocent enough, calling for public government agencies to “coordinate and expedite their reviews, consultations, and other processes as necessary" so as to create "a more efficient domestic pipeline system for the transportation of crude oil." But people and groups that have attempted to challenge pipeline projects describe the order as little more than a gift to the oil and gas industry. “It is downright foolhardy to cut corners on safety reviews for permitting the southern segment of the Keystone XL pipeline,” National Resources Defense Council’s program officer Susan Casey-Lefkowitz warned in a blog post, shortly after Obama enacted the expedited review process. At the same time, the United States Army Corps of Engineers began giving the green light to oil and gas pipeline projects that pass waterways under a quick process called Nationwide Permit 12. “While the Corps’ use of NWP [Nationwide Permit] 12 is not new,” wrote a coalition of nearly two dozen environmental groups in a recent legal objection, “it is only since 2012 that the Corps began using NWP 12 to approve massive pipeline projects." “To the best of our knowledge, prior to 2012, the Corps had never before used NWP 12 to permit hundreds or thousands of water crossings to approve a major pipeline project," the environmental groups added. The trick behind expedited permitting reviews is that they break up what should be one single regulatory action, evaluating the environmental impacts of a massive pipeline project as a whole, into piecemeal parts, according to Coyne Gibson, a volunteer with the Big Bend Conservation Alliance. Gibson and the alliance have been trying to fight the Trans-Pecos pipeline in the courts. The Trans Pecos pipeline, Gibson explains, is expected to make 135 water crossings. “They claim that each of those in isolation has no significant impact," Gibson tells ConsumerAffairs. But regulators did not examine the bigger pictire, Gibson says, evaluating the impact of a natural gas pipeline making 135 waterway crossings as a whole. Soon after Trans-Pecos made its presence known in Brewster County, locals like former County Commissioner Novovitch learned how limited federal involvement would be. Even though the pipeline crosses into Mexico, it flows only through one state in the United States. Federal regulators therefore classify the project as an “intrastate” pipeline. As an intrastate project, the pipeline is subject to limited federal review, as feds claim most of that burden falls onto the state of Texas. In fact, the Federal Energy Regulatory Commission determined that only one small section of the 148-mile pipeline--just over 1,000 feet--should be subject to federal review, because that is the one section crossing the Texas border into Mexico. Otherwise, the feds and pipeline operator alike say it is merely an intrastate project. The calls from Novovitch and other pipeline opponents to federal regulators were not heeded. “We have determined that if constructed in accordance with its application and supplements,” the Federal Energy Regulatory Commission wrote about the Trans-Pecos Pipeline January 2016, “approval of this proposal would not constitute a major federal action significantly affecting the quality of the human environment.” FERC officially granted the company its presidential permit in May 2016. Pipes dot the hills of the Big Bend region, but much of the project is already buried. The Trans-Pecos Pipeline, according to Energy Transfer Partners, is expected to be in service by March 2017.